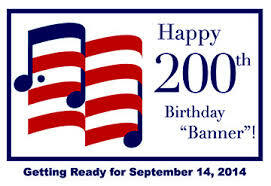 The Star Spangled Banner is 200 years old this year. Like many Americans, I suspect, I learned in school that it was written by Francis Scott Key after a battle in the War of 1812—possibly to the tune of an old drinking song. I assumed it became the national anthem soon after that. I was wrong on several fronts. It turns out the United States’ national anthem has a long and interesting history—along with multiple creative variations. The Star Spangled Music blog is a fascinating look at the intersection of music and history—with wonderful free teaching materials. 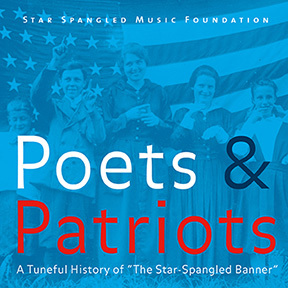 Their Poets and Patriots recording project presents the history of the Star Spangled Banner in its many variations. While the song (written for an amateur music and supper club) was not officially adopted as the U.S. national anthem until 1931, it has a long history. The tune, named “To Anacreon in Heaven” has been used since the 17th century for everything from a birthday tribute to George Washington to a parody of military adventures and drinking titled “Jack Oakum in the Suds.” As it became increasingly associated with patriotism, the tune was used to effect by multiple political causes. 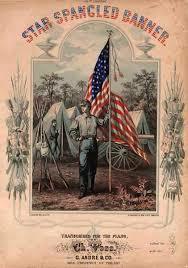 A 1843 temperance song “Oh! Who Has Not Seen” tells the tale of a drunkard and his spouse, including phrases like, “havoc of rum and the bottle’s confusion.” William Lloyd Garrison’s anti-slavery newspaper published an abolitionist lyric “Oh, Say Do You Hear,” that included the line “our star-spangled banner at half mast shall wave / o’er the death-bed of Freedom—the home of the slave.” Can’t you just imagine singing it? This information, and more, is contained in the free CD booklet that accompanies a recording of multiple versions of the anthem. You can hear some of them on the project’s YouTube channel. Follow the links to download the CD itself from iTunes or listen to it on Spotify. If you are curious, you can learn more on the project’s curriculum page or join their teacher network for free materials. To me, this is a fine resource for teachers of music and history. It is also a fascinating glimpse into the creative efforts that allowed the same tune to be used for multiple purposes across hundreds of years. Wouldn’t it be interesting to have students experiment with something similar? Take a familiar tune (perhaps “Home on the Range” or “Yankee Doodle”) and have students write lyrics appropriate to the era of history you are studying. While you are at it, you might want to have them research the way Yankee Doodle has changed over time. Or, pick a song from the era you are studying, and have students write lyrics appropriate to an event or issue today. I wonder how Yankee Doodle might sound as it reflects global warming or bullying? Older students might try creating two sets of lyrics, reflecting two sides of a current local issue. That’s an opportunity for flexible thinking at multiple levels. If your students write lyrics, we’d love to hear them. And get ready for the anthem’s birthday, September 14!